1. Heat a wide, heavy-bottomed pan over medium flame. 2. Pour the milk and bring to a boil. 3. Simmer till the milk is reduced by almost 80% and all the while pushing the cream that is formed on top to the sides. 4. Add sugar, cardamom powder, saffron strands and pachai karpooram. 5. Switch off the flame, stir gently till sugar has dissolved completely and cool. 6. Scrap the sides and add all the cream (pushed to the sides) to the remaining milk. 7. Garnish with almonds and pistachios. 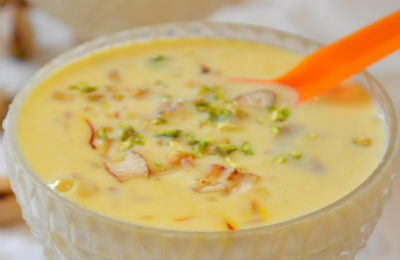 Feel free to comment or share your thoughts on this Basundi Recipe from Awesome Cuisine.